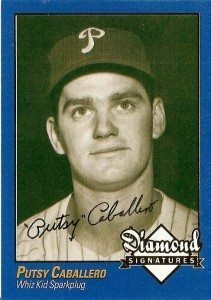 Ralph “Putsy” Caballero became the National League’s youngest third baseman ever when he debuted with the 1944 Phillies at age 16. Through 1952, he provided Philadelphia with utility infielder skills and one winning personality. Teammates marveled at his card-playing ability. 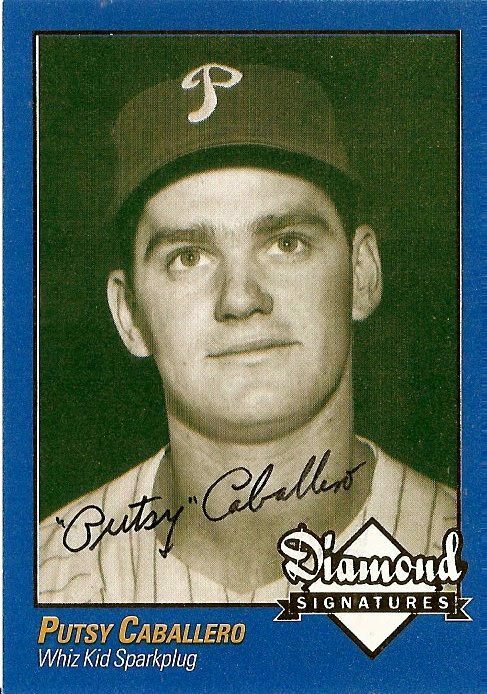 In retirement, Caballero joked he may have won more money at cards than he made in baseball. Caballero’s major league challenges pale to what he faced in 2005. The Louisiana resident lost his home and memorabilia from his Philadelphia days to Hurricane Katrina. He salvaged a Phillies uniform and autographed team picture from his 1950 “Whiz Kids” teammates. The World Series ring seems to have remained on his finger since 1950. “Richie Ashburn was my teammate. My home run (in 1951, the only one in 322 career games) was a thrill. Off George Spencer, the Giants ace relief pitcher. (Our) batboys were 12 years old then. Not much older than me.